You can continue to protect them! Please seek an advisor before drafting your will. For more information, view our Priests for Life Legacy Family brochure or contact us in the ways given below. 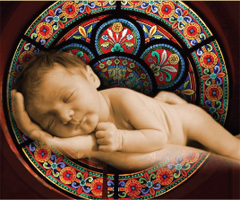 Priests for Life is the largest pro-life organization in the nation and represents a family of ministries that reach and enrich every aspect of the pro-life movement, for clergy and laity alike, in a wide variety of activities. This has come to pass precisely because priests are not ordained for themselves, but for the people. So in activating clergy, we are activating all the segments of the Church, the pro-life movement, and the wider society in the defense of life. Thanks to the unwavering support of the People of Life, Priests for Life has become the face and voice of America’s pro-life movement. The Priests and Pastoral Associates of Priests for Life preach the Gospel of Life to countless millions. They do so through parish pro-life missions, speaking engagements all across the country, TV and radio programs, appearances on talk shows, informative videos for Youtube, publications, and the pages of the Priests for Life website: www.priestsforlife.org – the most popular pro-life website in the country. In all these ways and more, Priests for Life is teaching literally tens of millions of Americans that the right to life is the fundamental human right; the right upon which all other human rights stand. By partnering with Priests for Life, you will be doing the most you can to protect and defend the youngest members of our human family. All inquiries are treated with complete confidentiality. Priests for Life is a 501 (c)-3 organization. All donations are tax-deductible. When the time comes, as it surely will, when we face that awesome moment, the Final Judgment, I’ve often thought, as Bishop Fulton Sheen wrote, that it is a terrible moment of loneliness. You have no advocates. You are there standing alone before God, and the terror will grip your soul like nothing you can imagine. voices that have never been heard in this world, but are heard beautifully and clearly in the next world.